Franklin D. Roosevelt was elected to the first of four terms as President in November 1932. Assuming the Presidency at the depth of the Great Depression, he promised prompt and vigorous action, asserting in his Inaugural Address, "...the only thing we have to fear is fear itself. His experimental economic and social program known as the "New Deal helped bring about a national economic recovery.When the U.S. was drawn into World War II in 1941, Roosevelt committed the nation's manpower and resources to defeat the fascist powers of Germany, Japan, and Italy. Roosevelt passed away a few weeksbefore Germany surrendered, but under his leadership, the U.S. emerged from World War II as the world's foremost economic, political, and military power. Meticulously designed, this dazzling tribute to America's 32nd President features a highly detailed engraving of FDR on the obverse. The Franklin D. Roosevelt commemorative coin is available exclusively from American Mint and is limited to only 9,999 complete collections worldwide. 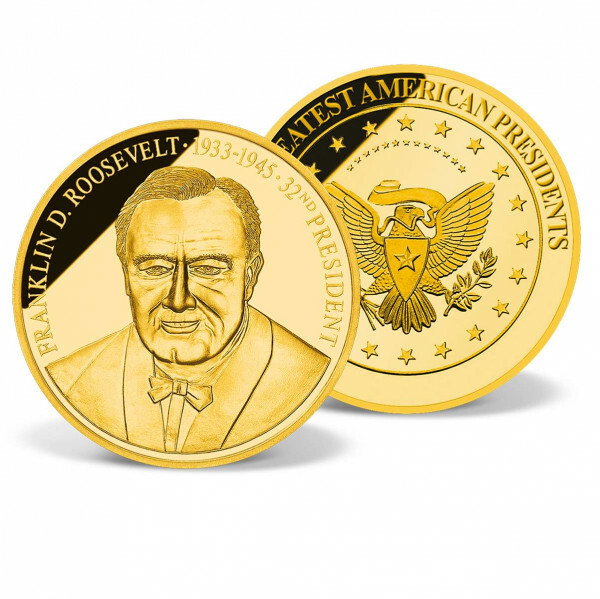 Minted to the highest quality "Proof standard and layered in 24k gold, it comes in its own protective capsule to preserve it for generations to come - a true collector's item.